Moline (/moʊˈliːn/ moh-LEEN) is a city located in Rock Island County, Illinois, United States. With a population of 43,977 in 2010, it is the largest city in Rock Island County. Moline is one of the Quad Cities, along with neighboring East Moline and Rock Island in Illinois and the cities of Davenport and Bettendorf in Iowa. The Quad Cities have an estimated population of 381,342. The city is the ninth-most populated city in Illinois outside the Chicago Metropolitan Area. 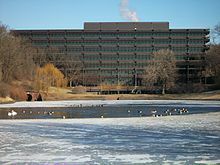 The corporate headquarters of Deere & Company is located in Moline, as was Montgomery Elevator, which was founded and headquartered in Moline until 1997, when it was acquired by Kone Elevator, which has its U.S. Division headquartered in Moline. Quad City International Airport, Niabi Zoo, Black Hawk College, and the Quad Cities campus of Western Illinois University-Quad Cities. Moline is a retail hub for the Illinois Quad Cities, as South Park Mall and numerous big-box shopping plazas are located in the city. In the mid-1990s, the city undertook major efforts to revitalize its central business district, which had declined after suburban growth and retail changes after the 1950s and 1960s. Today, Moline's downtown again serves as one of the civic and recreational hubs of the Quad Cities; many events take place at the 12,000-seat TaxSlayer Center (formerly known as The MARK of the Quad Cities and iWireless Center) and at John Deere Commons. Downtown Moline features hotels such as Radisson and Stoney Creek Inn, and commercial areas such as Bass Street Landing and the historic 5th Avenue. The city of Moline is nestled beside and on a broad bluff situated between the banks of the Mississippi River and Rock River in Rock Island County, Illinois. The city's highland areas are cut across by many deep ravines that break up the city into natural neighborhoods. The city is bounded to the east by East Moline and to the west by Rock Island. Moline is located approximately 165 miles (266 km) west of Chicago and approximately 164 miles (264 km) northwest of Springfield, Illinois. 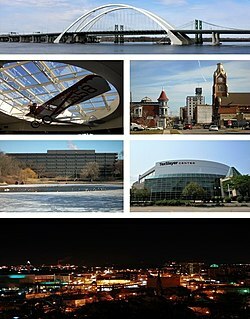 Moline and its neighboring communities within the Quad Cities form the largest urban area along the Mississippi River between Minneapolis to the north and St. Louis to the south, and are located approximately halfway between them. The area is served by four interstate highways: Interstate 74 (which runs directly through Moline, bisecting it in roughly equal halves), Interstate 280 (which serves as a ring road around the Quad Cities), Interstate 80 (which crosses the Mississippi River a few miles to the northeast of Moline), and Interstate 88 (which begins on the eastern border of the Quad Cities and ends in Hillside, Illinois, near Chicago). The Quad City International Airport, located on the southern fringe of the city to the south of the Rock River, is home to four commercial airlines providing non-stop flights to eight different cities. This airport is the third busiest one in the state of Illinois, following Chicago's O'Hare International Airport and Midway Airport. Typical of the northern half of Illinois, Moline experiences a humid continental climate (Köppen Dfa) with hot, humid summers and cold, moderately snowy winters; precipitation is distributed throughout the year but is greater in the warmer months. The normal monthly mean temperature ranges from 22.6 °F (−5.2 °C) in January to 75.4 °F (24.1 °C) in July; on average, there are 23 days of 90 °F (32 °C)+ highs, 43 days with a high at or below freezing, and 11 days of sub-0 °F (−18 °C) lows annually. Extremes in temperature have ranged from 111 °F (44 °C), set on July 14, 1936, down to −33 °F (−36 °C), set on January 30, 2019; the record coldest maximum temperature is −12 °F (−24 °C) on January 18, 1994 and January 29, 1966, while the record warmest minimum is 84 °F (29 °C), set the same day of the record high. [a] Temperatures reach 100 °F (38 °C) only several years per decade, and −20 °F (−29 °C) readings are even rarer; the last occurrence of each was July 25, 2012 and January 31, 2019. The average window for freezing temperatures is October 10 thru April 24, allowing a growing season of 168 days. Indigenous peoples of varying cultures inhabited areas along the river over thousands of years, using it for transportation, water and fishing. According to the Rock Island County Historical Society, the first more permanently settled inhabitants of the Moline area are thought to be the Sauk and Meskwaki Indians, who founded the village of Saukenuk in 1720 along the Rock River not far from its confluence with the Mississippi. This tribe saw the land between the Rock and Mississippi rivers as ideal for farming and fishing. By the early 19th century, this once peaceful area became a site of violent confrontations between European-American settlers, arriving in greater numbers and encroaching on Native American land, and the Sauk and Fox tribes. In 1832 Chief Black Hawk declared war on the United States, initiating the Black Hawk War. When the war ended later that year, Black Hawk and his people were forced to leave the area and go north, paving the way for more European-American settlers to enter the Mississippi Valley. In 1837, David B. Sears and a group of associates built a 600-foot (180 m) stone-and-brush dam across Sylvan Slough, thereby connecting the southern bank of the Mississippi River to what is today called Arsenal Island. The dam not only served as an access road between the island's settlements and the mainland, but it provided water power for a mill which Sears built to saw wood, grind corn, and card wool. The water power generated by the dam attracted many industrialists. Over the next seven years, a number of factories sprouted up along the shoreline. A factory town was platted in 1843 on the Illinois shore under the working name of "Rock Island Mills". The name did not stick. When Charles Atkinson, one of the major landowners in the area, was offered the choice of naming the town Moline ("City of Mills", from the French moulin, as suggested by a local surveyor P.H. Olgilvie) or Hesperia (meaning "Star of the West"), he chose Moline. The town of Moline was incorporated on April 21, 1848 under Illinois state law and granted a charter for a trustee form of government. The same year, John Deere, the inventor of the self-scouring steel plow, relocated his steel plow company from Grand Detour, Illinois, to Moline. At the time, Moline had a population of only a few hundred, mostly involved in work at the mill. Despite Moline's small size, Deere saw several promising elements there: Moline's dam and coal deposits would provide a good source of power; Moline was near the other well-established towns of Stephenson (later renamed Rock Island) in Illinois and Davenport in Iowa; and Moline's access to the river would make shipping goods cost-efficient. As Deere expanded his factories, Moline grew in area and population. Charles Atkinson and others successfully lobbied the federal government to get the first transcontinental railroad to pass through Moline and to cross the Mississippi over Arsenal Island. The railroad, which arrived in 1854, carried thousands of immigrants – at that time mostly Swedish, Belgian, and German, reflecting areas of economic problems in Europe – to Moline's borders. The immigrants, most of whom knew little or no English, responded to the call of "John Deere Town" by the conductor. The railroad connected the region to the national economy, ending its previous isolation, and ensured the future success of the area. Manufactured goods were increasingly transported over rail instead of by water. Moline's founding fathers were primarily ambitious industrialists from New England. David B. Sears came to Moline from the Northeast by way of Cairo, Illinois, and Atkinson, John W. Spencer, and Spencer H. White, other prominent founding men, were also New Englanders. They brought a stern work ethic and controlled civic life; Moline, in contrast to its neighbors, was not a "shoot ‘em up river-town." An article in the Moline Workman in 1854 noted that a "much duller town could not be scared up this side of Sleepy Hollow." Moline attracted large waves of immigrants from Sweden, who were believed to be family-minded, God-fearing, community-oriented workers who rarely went on strike. As Moline grew around its mills and factories, and as its neighbor to the west, Rock Island, continued to grow at a similar pace, the neighboring towns ran up against one another's borders relatively quickly. In the mid-19th century, articles about "consolidation" were a daily feature in the Moline Workman and the Rock Island Advertiser; city leaders dreamed of the joint city becoming the largest in the state. As local leaders sat down to discuss consolidation, however, disputes arose, with the most important being which city would subsume the other. As the county seat and earliest settlement on the Illinois side, Rock Island argued that it should annex Moline; Moline, being more prosperous and better known nationally, wanted to keep its name. Other points of conflict included that Moline did not want to have to assume any of Rock Island's public debt; Rock Island feared that a union with Moline would drive down its property values; and the citizens of the two towns, representing different regions, classes, occupations and ethnicities, widely disagreed on major political issues of the day. Many leaders of Rock Island, a community founded largely by Southerners, remained sympathetic to the Confederate cause throughout the Civil War. Meanwhile, Moline was ardently Republican. The talks of consolidation ceased, although they would later return but were never resolved in favor of the merger. After the Civil War, the population of Moline continued to grow. The street grid was expanded to the east and west along the shoreline and to the south up the bluffs. There was a severe housing shortage; few men were rich enough to invest in real estate other than what they could afford to build for themselves, and few incoming workers had sufficient funds to build a home. Nevertheless, Moline's expansion was generally an orderly affair. The street grid remained a set of rectangular blocks, and though no zoning commission or local authority directly oversaw construction, the unwritten code of carpenters, masons, and citizens kept the city a well-planned place. Temperance societies and lyceums joined other reform movements and social organizations in prominence within the community. The quality of life was generally regarded as quite good: "The laboring men of Moline are among the most prosperous to be found in the country. Instead of spending their spare earnings in saloons and dram shops, they carefully hoard them and in a few years a little home of their own is the result." Over time, John Deere expanded operations into other agricultural equipment, and Deere-affiliated factories employed the bulk of Moline's workforce. Soon other Moline-based companies became known around the country for their products. These include Dimock, Gould, and Co., Moline Pipe Organ Co., and Moline Furniture Works, to name a few. In addition, several pioneering automobile companies operated in the city, among them Moline Automobile Company, Moline Wagon Company, Stephens (a marque of the Moline Plow Company) and Velie Motors Corporation. In the midst of steady growth and changing times, the town's founders struggled to maintain their positions of authority. Moline was re-chartered as a city under a mayor/aldermanic form of government on April 21, 1872, and John Deere, the longtime resident and entrepreneur, was defeated by Daniel Wheelock, a newcomer, for the first mayorship. Belgian and Swedish immigrants began arriving in a huge influx, settling into a neighborhood on the bluffs in the southwestern part of the city. Belgian immigrants came predominantly to work in the fledgling auto industry in Moline, Velie Motors, founded by a Deere relative. For a time, Moline had the second largest Belgian population in the country after Detroit. Swedish immigrants continued to be drawn to Deere & Company, with John Deere as leader continuing to hire new employees in droves until his death in 1886. By the 1920s and 1930s, the appearance of East Moline in Illinois and Bettendorf in Iowa reflected the further growth and diversification of the region. Moline emerged as a retail, transportation, and cultural hub on the Illinois side of the river. The first metropolitan airfield, the Moline Airport, opened in 1926 and later provided commercial air service to Chicago and St. Louis. With federal funds from the Works Progress Administration, the Iowa-Illinois Memorial Bridge, a single-span, two-lane highway bridge built for automotive traffic, was concluded between Moline and Davenport in 1935 and quickly became the preferred method for interstate transit. A bustling retail sector emerged in downtown Moline, anchored by merchants like the New York Store, Sears & Roebuck, and JC Penney. The economic reliance on the farm implement industry continued as Deere & Company emerged to become the largest agricultural machinery company in the world. Colonel Charles Deere Wiman, the President of Deere & Company, re-affirmed Deere's commitment to the Quad-Cities region by building several new factories in Moline, East Moline, Silvis, and Milan in Illinois and Davenport in Iowa. Although the city did not suffer during the 1950s and 1960s, those decades marked a departure from the city's earlier trajectory of unceasing upward growth. The zoning ordinance drawn up in 1929 predicted a population of 70,000–80,000 for Moline in 1980, but Moline actually only attained 45,000 by that year. The primary problem for Moline, and the Quad-Cities at large, in this period was the area's lack of a strong national identity. The Moline Association of Commerce marketed the Quad-Cities under the motto of "Joined together, as the boroughs of New York City" throughout the 1940s and 1950s, with Moline as the "nucleus", but few corporations bought into the analogy. Despite the Quad-Cities’ status as "the largest metropolitan area between Chicago, Omaha, Minneapolis, St. Louis, and Kansas City", the area remained relatively unheard of. Existing companies, including John Deere, Alcoa, Caterpillar, Case, and International Harvester all continued to grow and expand operations in the area, but no real diversification of local industry occurred; Moline remained steadfastly dependent on the farm implement industry for its economic solvency, a dependency that later proved disastrous. As a result of the gradual dissolution of the trends of industrial expansion and the end of the age of immigration, Moline's population stagnated throughout the mid-to-late-20th century, settling in the 40,000–45,000 range, where it remains today. The central retail district gradually closed down as the area's first shopping malls opened in the early 1970s, pulling business away from downtown. This southward trend in retail occurred despite the extension of Interstate 74 through the city and across the river on the Iowa-Illinois Memorial Bridge in 1974, an infrastructure improvement that made Moline's downtown more accessible and brought thousands of commuters and travelers through Moline each day. Though most civic leaders and journalists had been optimistic-–one reporter claimed "almost every indicator of economic, population, and civic growth points to the fact that Moline's potential for growth is greater than ever . . . especially in its now readily accessible downtown . . ." – there was no stopping the dawn of the age of strip retailing. Perhaps the greatest problem befalling Moline in the second half of the 20th century was the farm crisis of the 1980s. Moline's economic vitality was sapped as the agricultural crisis crippled the farm implement industry, the force which had shaped the development of Moline since the city's earliest days. Plant after plant laid off workers by the thousands, and unemployment in the area soared to twice the national average. Even Deere & Company moved most of its factory operations out of Moline, though it maintained its world headquarters in Moline in a specially commissioned building that was designed by Eero Saarinen. The LeClaire Hotel, the tallest building in Moline and a longtime symbol of the city's wealth and prestige, closed its doors. The 1990 census showed a population loss for the city for the second straight decade. In the 1990s, Moline began staging a comeback through the redevelopment of its riverfront. Deere & Company demolished its vacant riverfront factories and donated the land to the city so that it could build a civic center on the space. The Mark of the Quad-Cities, now known as the TaxSlayer Center, was completed in 1993 and is now the home to large conventions, concerts, high school sports tournaments, and a host of other events. The Quad City Steamwheelers, an arena football team, played their af2 home games at the arena from 2000 to 2009 when the league ceased operations. It has also been home to several minor league hockey teams including both the original Quad City Mallards and a [[Quad City Mallards|newer Quad City Mallards, the Quad City Flames, and the Quad City Storm. In the late 1990s, John Deere Commons was built, a multimillion-dollar entertainment and tourism complex containing a hotel, restaurants, offices, a John Deere Collector's Center (located in a re-created 1950s John Deere dealership), the John Deere Store, and the John Deere Pavilion, a tourist center showcasing the history of agriculture in the Midwest. The Commons attracts 400,000 visitors a year, injecting a tremendous boost to the downtown economy. Renovations have been completed on many old brownstone buildings, and plans for shoreline mixed-use condominium and retail developments are in the works on the site of vacant industrial land. Moline still reflects the rich culture of the successive waves of immigrants from France, Germany, Sweden, Belgium, Eastern Europe, and most recently, Mexico. Events such as the annual Greek Cultural Festival at John Deere Commons, rolle bolle tournaments at Stephen's Park, and "Viva! Quad~Cities" all reflect Moline's diverse heritage. Downtown Moline also plays host to events of regional importance such as Taste of the Quad Cities, Race for the Cure, the Quad City Marathon, and the Lighting of the Commons. Since the late 2000s to the early 2010s, Moline has seen progressive growth in its downtown area. The current projects include a new nine-story building for Kone Elevator's American Headquarters (formerly Montgomery Elevator) and its nearly 250 Quad Cities' area employees. The building opened in August 2012, and also has a combination of active and passive energy strategies includes an array of 1365 distributed solar panels, which is now the third largest in the state of Illinois. Other projects include new lofts that opened up in 2011, and the I-74 Corridor Project is planned to build 3 auxiliary lanes from Avenue of the Cities passed 53rd Street in Davenport, with a new I-74 Bridge spanning 4 lanes in each direction, also an observation deck overlooking the Mississippi River, construction date is still unknown. In 2012, Western Illinois University-Quad Cities opened the new river front campus, an $18.2 million first phase of the project has 60,000 square feet, making it the only college campus along the Mississippi River. It includes 14 classrooms and four meeting/conference rooms. The second phase, including five connected buildings, is expected to cost $42 million and have 90,000 square feet. Those buildings will include the colleges of arts and sciences, education and human services, fine arts and communications, as well as the campus library. The second phase of construction is set to be completed by 2014. Amtrak is set to bring service back to the city with a Moline to Chicago line sometime in 2017. More projects are being planned, all a part of the city's "Moline Centre" downtown plan. As of the census of 2010, there were 43,977 people, 19,032 households, and 11,594 families residing in the city. The population density was 2,805.7 people per square mile (1,083.3/km²). There were 19,487 housing units at an average density of 1,249.2 per square mile (482.3/km²). The racial makeup of the city was 86.2% White, 4.6% African American, 0.2% Native American, 3.5% Asian, 3% from other races, and 2.5% from two or more races. Hispanic or Latino of any race were 9.4% of the population. Through the Neighborhood Partnership Program, the City of Moline has established nine city-sponsored neighborhood associations and is working to form more. These associations assist their residents by organizing neighborhood clean-up days, participating in the crime watch program, planning social activities, and other activities. Downtown / Moline Centre: Moline's downtown, now known as Moline Centre, is the historic area bounded approximately by 12th and 34th Streets and the Mississippi River and 6th Avenue. The area is home to Moline's City Hall, its original, and now vacant, Carnegie-sponsored public library, and other civic institutions. A major retail center in the 1950s and 1960s, today the area is home to the John Deere Commons development, including the John Deere Pavilion, the TaxSlayer Center, and other restaurants and entertainment venues. Floreciente: This neighborhood, stretching below the bluff along the Mississippi River from downtown to the east and Rock Island to the west, is the traditional home to the city's Latino population, many of whom hail from the central state of Guanajuato in Mexico. Olde Towne: Olde Towne is bounded to the west by Rock Island, to the east by 12th Street, to the north by 12th Avenue, and to the south by 19th Avenue. Olde Towne was the traditional home of Moline's large Belgian population. According to the Belgian Culture Center, Moline once had the largest Belgian population in the United States and now has the second largest. Belgium maintains an honorary consulate in Moline located in this neighborhood. Uptown: East of Olde Towne is a similar neighborhood, though not traditionally as Belgian but rather German and Irish, called Uptown. Karsten's Park: This neighborhood is centered on the city park with the same name between 5th and 6th Streets and 22nd and 23rd Avenues. 7th Street is the main thoroughfare through this neighborhood of many ethnicities. Newer homes of the 1960s and 1970s era are located closer to 2nd Street, but the houses generally date from the 1920s–1940s. Wharton: Wharton, also sometimes known as Willard, is centered at the intersection of 16th Street and Avenue of the Cities (formerly 23rd Avenue). The Wharton Field House gives the neighborhood its name, and the field house (built in 1928 and named for P.T. Wharton, former president of the Moline School Board) and the adjacent Browning Field (named after John T. Browning) hosts events such as Moline Maroons basketball, football, and soccer games as well as track and field events. Wharton Field House used to host the Quad City Thunder CBA Basketball before the Mark of the Quad Cities (now the TaxSlayer Center) opened, and was once home to the NBA's Tri-Cities Blackhawks. The neighborhood contains many large two and three story brick Georgian homes. Hamilton Heights: The neighborhood south of Karsten's Park is known as Hamilton Heights after the local elementary school in the area. Houses here mostly were built in the 1940s and 1950s and many are of brick construction, especially along 7th Street. The neighborhood is mainly residential. Wildwood: Just before the city's western arterial, 7th Street, passes downhill into the Rock River Valley lies the neighborhood of Wildwood. The old Velie Mansion, now Quad City Bank and Trust, is on the fringe of the neighborhood. A small part of the Wildwood neighborhood actually lies in Rock Island. Prospect Park: This is a name for the broad area south of Avenue of the Cities between I-74 to the east and 7th Street to the west. 16th Street houses WQAD-TV, and the actual Prospect Park itself, one of the largest in the city. Behind the park are many older large homes. The neighborhood is also home to Quad City Music Guild. The Prospect Park neighborhood is adjacent to SouthPark Mall and other stores. Many restaurants are also adjacent to this neighborhood. Park Hill: Park Hill is bounded by 4th Avenue to the north, 12th Avenue to the south, 19th Street to the west, and 27th Street to the east. This neighborhood has views of the Mississippi River from its bluffs. Park Hill is one of Moline's oldest neighborhoods, with many of its homes built for the workers of John Deere. Several neighborhood homes were built between the early 20th century and 1930s. Riverside Park, which gives the neighborhood its name, contains several baseball fields, a pond, two cemeteries, and the Riverside Aquatic Center, a pool with water slides and fountains. Forest Hill: This neighborhood, centered along 27th Street between 12th and 23rd Avenues, is one of the many solely residential neighborhoods which predominate in the east side of town. Forest Hill, much like Wharton, contains older homes, unusual for the east side of town, which contains mostly newer construction. Highland: Highland is a neighborhood along Avenue of the Cities and was mostly built during the Great Depression. Molette: After World War II, the influx of veterans coming home from the war created a huge demand for starter housing. The developers of Molette, as in Levittown, responded to this need by creating large tracts of prefabricated homes. Rockview Estates: This neighborhood is west of 41st Street and between John Deere Road and Moline High School. The neighborhood sets on the ridges above the Rock River Valley. There are few commercial establishments in the area, although the Moline Public Library is nearby on 41st Street. Heritage: This neighborhood lies to the south of the big box retail of John Deere Road between 41st Street and 53rd Street. It is bounded to the south by the Rock River. A mile to the east of Heritage lies the Green Valley Sports Complex, home to the city's largest complex of baseball, softball, and soccer fields. Just south of the neighborhood on the north bank of the Rock River is Old Green Valley Park with views of the river and two boat ramps. Heritage homes were built between 1960 and 1980 and consist of ranch, split, and trilevel homes. Deerview / Walton Hills: Deerview is one of the newest neighborhoods in the city, with a majority of homes built in the 1980s or later. Many of the homes in the Walton Hills addition have been built in the first decade of the 21st century and have typically adopted traditional suburban styles. Next to Walton Hills lies Millennium Park, the city's newest park, which is jointly maintained with East Moline. The John Deere Pavilion at John Deere Commons contains exhibits celebrating the history of the agricultural implements industry in the Midwest and showcases a variety of past and present John Deere plows, tractors, combines, and other machinery. The LeClaire Hotel is the tallest building in Moline. For institutions of higher education in the area, see Quad Cities Colleges and Universities. Moline is served by Moline School District No. 40, which serves the student-age populations of Moline and Coal Valley. The district educates approximately 7,500 students in twelve elementary schools, two middle schools (John Deere Middle School and Woodrow Wilson Middle School) and one high school (Moline High School). St. Paul's Lutheran School is a Christian Pre-K-8 grade school of the Wisconsin Evangelical Lutheran Synod in Moline. Moline was home to the Tri-Cities Blackhawks, a professional basketball team that evolved into what is today the Atlanta Hawks. The Blackhawks played at Wharton Field House from 1946–1951. For 27 seasons between 1914 and 1948, the Moline Plowboys played minor league baseball at Browning Field. The Plowboys played primarily in the Three-I League. Such notable future Major Leaguers as Rube Ehrhardt, Peanuts Lowrey, Claude Passeau and Eddie Waitkus played for the Plowboys, whose team president for three years was Warren Giles, later inducted in the National Baseball Hall of Fame. Moline's TaxSlayer Center is currently home to the Quad City Steamwheelers, an indoor football team in the Indoor Football League. The Taxslayer Center is also home to the Quad City Storm of the SPHL The Quad Cities are also home to the Quad City River Bandits, the Single A Midwest League affiliates of the Houston Astros. The River Bandits play their home games at Modern Woodmen Park (formerly John O'Donnell Stadium) in Davenport, Iowa. Ken Berry, actor, F Troop, Mayberry R.F.D. Charles F. Carpentier, businessman and politician, was born in Moline. Donald D. Carpentier, businessman and politician, was born in Moline. The Quad Cities has numerous media outlets, including dozens of radio stations, local affiliates of Fox, NBC, ABC, and CBS, and three newspapers. The Dispatch, formerly the Daily Dispatch, is the traditional paper of the city and also serves Coal Valley, East Moline, and other communities to the east. The Rock Island Argus, owned by the same company as the Dispatch, carries substantially the same print coverage. ^ The summer of 1936, as part of the Dust Bowl, was particularly extreme, setting the records for annual number of daily highs reaching 90 °F (59) and 100 °F (21), as well as the hottest month on record; July averaged 85.0 °F (29.4 °C). ^ a b "2010 Census U.S. Gazetteer Files for Places – Illinois". United States Census. Retrieved October 13, 2012. ^ "Annual Estimates of the Population of Metropolitan and Micropolitan Statistical Areas: April 1, 2010 to July 1, 2011". 2011 Population Estimates. United States Census Bureau, Population Division. April 2012. Archived from the original (CSV) on April 27, 2012. Retrieved May 10, 2012. ^ "Moline History". Moline Preservation Society. Retrieved April 16, 2018. ^ a b c d Cite error: The named reference NOAA was invoked but never defined (see the help page). ^ Roald Tweet, The Quad Cities: An American Mosaic, Rock Island, Illinois: East Hall Press, 1996, p. 20. ^ "Stephens Salient page at The Crittenden Automotive Library". Carsandracingstuff.com. Retrieved November 12, 2012. ^ "Velie page at The Crittenden Automotive Library". Carsandracingstuff.com. Retrieved November 12, 2012. ^ "Calgary Flames farm move from Quad Cities to Abbotsford". February 12, 2010. Archived from the original on |archive-url= requires |archive-date= (help). ^ "City of Moline, Illinois – Official Website – Moline Centre Main Street". Molinecentre.org. Retrieved November 12, 2012. ^ Brandon Renkes. "Economic Development". Renew Moline. Retrieved November 12, 2012. ^ "City of Moline, Illinois; Comprehensive Financial Report; Year Ended December 31, 2017". Moline.il.us. Retrieved March 10, 2019. ^ Virgo Multimedia. "Playcrafters Barn Theatre – Community theater for the Quad-Cities". Playcrafters.com. Retrieved February 3, 2016. ^ "St. Paul's Lutheran School". ^ "Acie Earl". Basketball-Reference.Com. Retrieved October 19, 2012. ^ "John Getz trivia". IMDb.com. Retrieved November 12, 2012. ^ "Oscar Graham". Baseball Almanac. Retrieved October 19, 2012. ^ "Gene Oliver Stats". Baseball Almanac. Retrieved October 19, 2012. ^ "Dean Stone Stats". Baseball Almanac. Retrieved October 19, 2012. ^ "Al Van Camp". Basketball-Reference.Com. Retrieved October 19, 2012. Wikimedia Commons has media related to Moline, Illinois.